Interrupting this trip recap to talk sweet treats. I'm generally anti kitchen gadget since I like to keep my counters clean but as the temps have risen so has my interest in one of these fancy fast freezing popsicle machines. 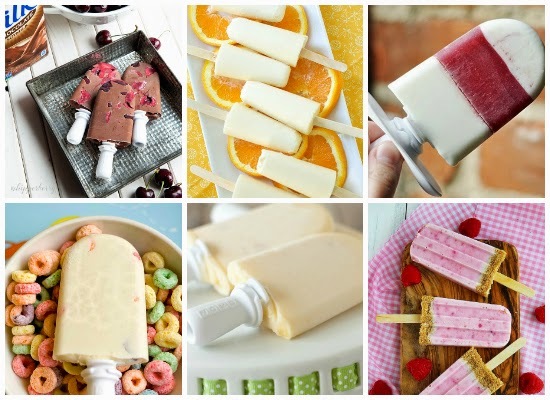 With that in mind, I thought I'd do a round of up some of the most tempting popsicle recipes I've been saving if I ever do break down and buy one. Anyone have a Zoku or something like it? Is it worth it/do you really use it? I haven't got one, but I want one now!! I bought really nice popsicle molds in fun shapes. The kids love all the cool molds - rockets, flowers, twin pops and , my favorite, ice cream cone molds. We make popsicles all summer long starting with strawberries in May. Have fun!! !